Please note that since my pieces are one of a kind - what you see today may not be there tomorrow.. STEP #1: Jot down the ID number or numbers, name of item and price marked. STEP #2:Send me an e-mail. Make sure you give me your name and e-mail address. Make sure also to include city, province and postal code (for shipping costs). I will get back to you, within a couple of days, with availability of piece, shipping costs and total price. Delivery would be four weeks after payment (personal check) has cleared. Certified check or money order will eliminate the time for clearing and a quicker delivery date. Shipping via ground is approximately one week. Please note all prices are in Canadian funds. "What and Why" page or click on the link at the bottom of the page. These boxes have a slightly oversized top with a chain that prevents over-opening. The sides have a small indentation to create a footed effect. The bottoms are clear glass. 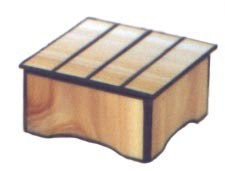 This box is similar to the standard box, but with a more complex design. It also has a chain to protect from over-opening and a clear glass bottom. 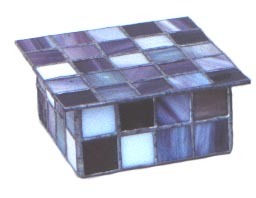 It is 5" wide x 5" deep x 2" high. 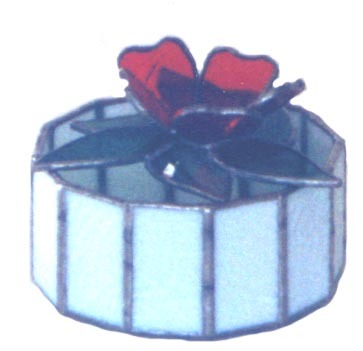 These circular boxes have a open lid that is a three dimensional flower with leaves that support the lid. The center of the flower is a complimentary colored glass nugget. The open lid allows for the fragrance of the pot pourri to escape. The bottoms are clear glass. This eight sided box is on the large size. The top is oversized and has a scalloped edge. 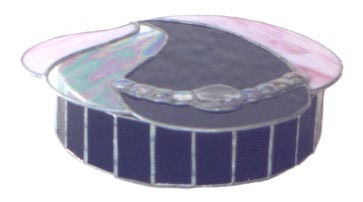 Four of the sides are enhanced with a glass nugget. The bottom is clear glass. It is 7.5" diameter x 3.5" high. This box has an over size scalloped lid. 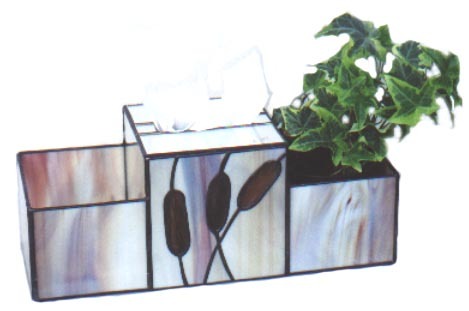 The lid is made with white/pink streaky opaque glass, iridescent clear glass and a sligthly textured black opaque glass. 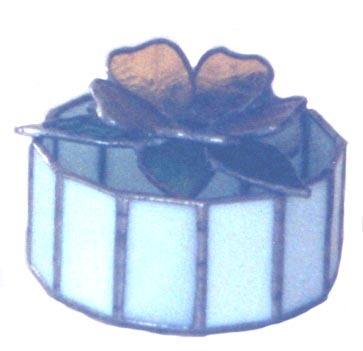 A swirl of small and large iridescent glass nuggets are the finishing touch to accent the top. 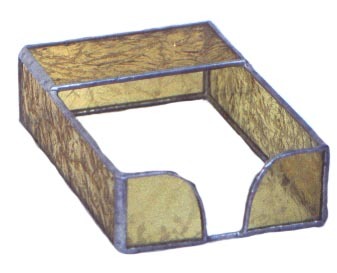 The body is constructed in a partial circle with the back of the box being flat. It's made with the same black glass as the top. The bottom of the box is clear glass. No patina has been applied to the sauldering lines. It is 9" wide x 9" deep x 2" high. 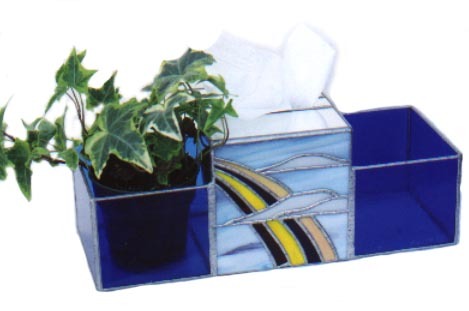 These boxes have a large storage area on either side of the tissue holder, ideal for any area of the home to catch those loose items and/or holding plants. 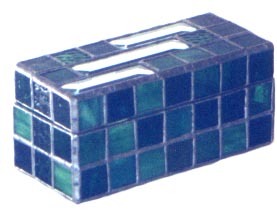 The tissue section holds a standard 5 x 5 x 5 tissue box. The bottom of the storage sections are clear glass. The overall dimensions are 13" wide x 5" deep x 5" high. One of my favorite type of boxes transporting me to pirate days. These boxes come in a multitude of shapes and sizes depending on my whim. 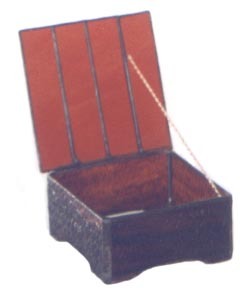 This box has a deep lid enhanced with three clear bevels. 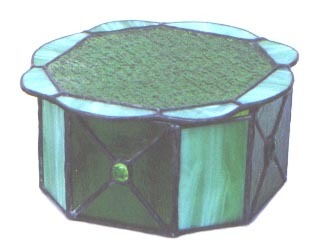 It's made from various shades of transparent to opaque green glass with no patina. This box has a deep three sided lid. 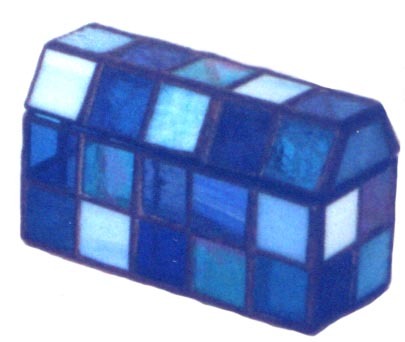 It's made from various shades of transparent to opaque blue glass with a black patina. 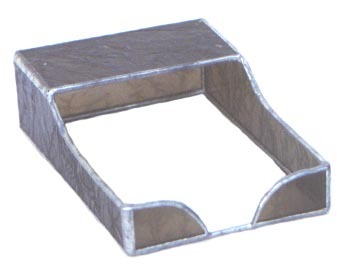 Note Paper Holders: These boxes are ideal next to a phone, or on a desk. They hold standard loose note paper. There are two designs, one in a more cubic look and the other has a softer look with curved sides. The bottoms are clear glass. They are 4" wide x 5.5" deep x 1.75" high. Stay tuned for more boxes in the future.